recognize the truth of the aforementioned words only if you have ever been to any of the South-East Asian developing economies, where, even after more than 60 years of independence from the British colonial rule, the common man’s importance seems to be diminishing continuously. 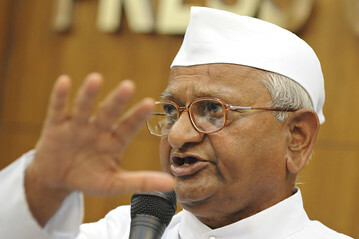 So who is this Anna Hazare? If you haven’t come across this name at least a hundred times on the newspapers in the past few months you seriously do not belong to this world. Anna Hazare is a dream that has successfully united all the Indians against the pervasive notion of corruption and oppression. This is the man–social activist and visionary— behind whom all Indians–devoid of castes or creeds—- could once again rally behind after the fight for independence in1957 for justice from the power-hungry corrupt politicians and greedy government-officers. This 71 year old man, through a series of hunger strikes, has successfully taught all Indians and also the rest of the world the very essence of patriotism that should be inherent inside every responsible citizen. Such was the aura generated by this white-clothed peace-loving follower of Mahatma Gandhi that even activists from the neighboring countries—which are also heavily afflicted by corruption and terrorism—could derive inspiration and fight more valiantly in their struggle for justice. Now I am a very pragmatic young man. Whenever something good occurs for too long I can sense something wrong behind it. Being quite pessimistic, initially I was apparently under the preconceived notion that Anna Hazare was simply another political pawn planted by the opposition in order to oust the dominating Congressmen from the Parliament. And although the omnipresence of corruption in today’s world does not elude me, at first I had thought that the charges brought against the six corrupt ministers were nothing but fabrications made deliberately to destroy the reputation of the Indian Government.